It's one of the best grilling weekends of the summer--Labor Day--so why not whip up a memorable burger? Made with ground lamb, which is rich in selenium and has less fat than beef, each slider is only 170 calories. It's one of the best grilling weekends of the summer--Labor Day--so why not whip up a memorable burger? This one definitely fills the bill. 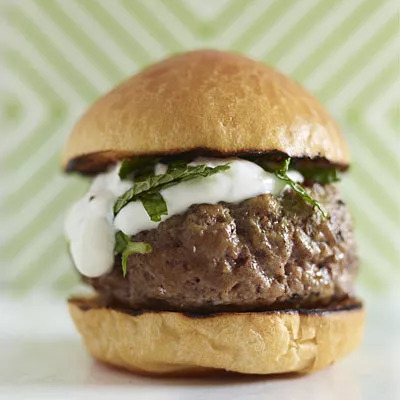 Made with ground lamb, which is rich in selenium and has less fat than beef, each slider is only 170 calories and low in saturated fat, cholesterol, and sodium. Just season lamb with salt and pepper, form into 1-inch-thick patties, and grill for 1-2 minutes per side. Top with the sauce--made with 2% reduced-fat Greek yogurt, lemon juice, salt, and pepper--and garnish with fresh mint leaves. Unforgettable!